In 2006, WisdomTree pioneered what we believed to be better investments and a better investor experience. Our exchange-traded funds (ETFs) are not beta—and they were only the beginning of the investment innovation we call “Modern Alpha™”. WisdomTree’s Modern Alpha™ strategies combine the outperformance potential of active management with all of the advantages of passive management to create ETFs designed to perform. 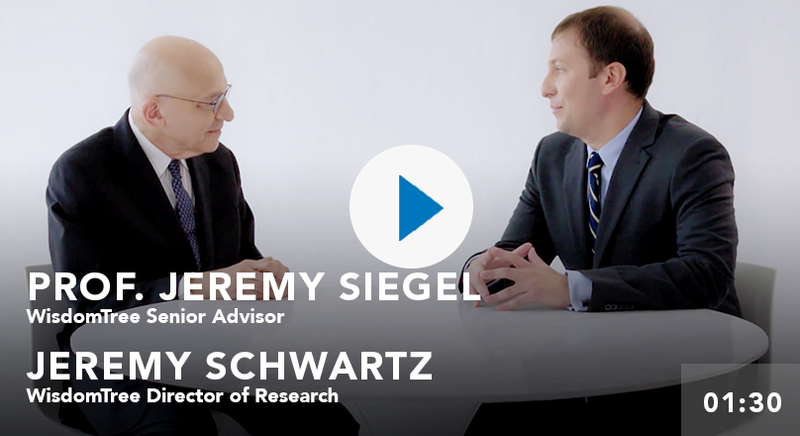 Professor Jeremy Siegel speaks with Jeremy Schwartz about WisdomTree being the first company he ever endorsed. Investors who register can access daily blog posts, the latest videos, podcasts and snapshots, and stay current with industry insights and more. TD Ameritrade is separate from and not affiliated with WisdomTree and is not responsible for, nor any endorsement of their services, policies, products or opinions should be inferred. TD Ameritrade is a trademark jointly owned by TD Ameritrade IP Company, Inc. and The Toronto-Dominion Bank. Used with permission.